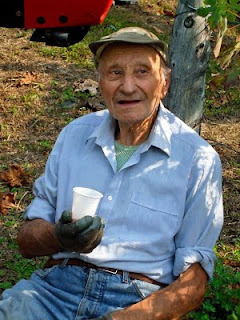 I am about to go to Italy, to my late father's village in the Canavese zone of Piemonte. The grapes in the surrounding vineyards will be ripe and ready, but, sadly, la vendemmia - the grape harvest - won't be for another two weeks. 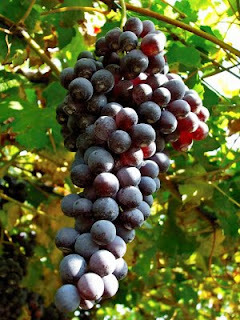 I'll be able to walk past vines and breathe in their aroma (maybe even eat a few grapes...? ), but I won't have the post-harvest pleasure of walking past cellars and inhaling their intoxicating fumes. And, of course, I won't be able to help out with the actual harvesting. 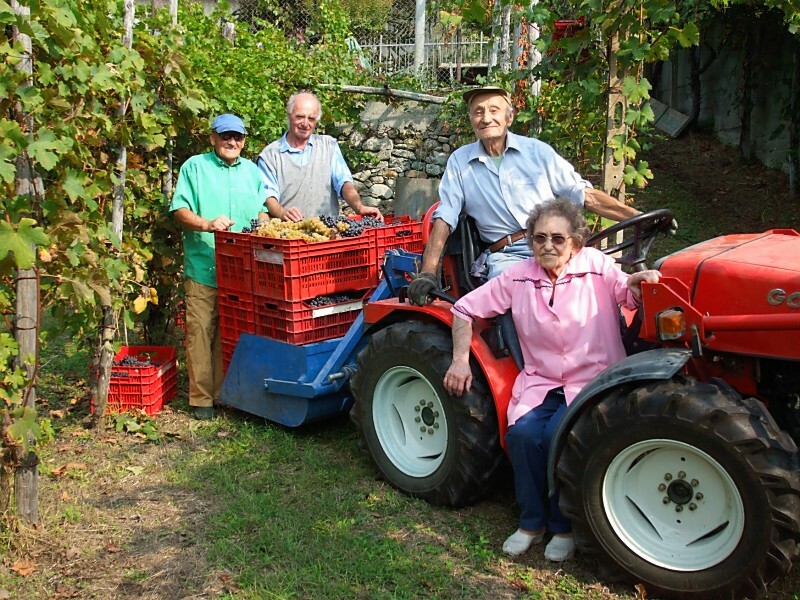 La vendemmia has traditionally been a communal event, with people gladly helping each other out. The vineyard owner (or rather his wife!) provides food and drink for all helpers, and by common consent those who do not own vineyards can take a few bunches of grapes home (and just as in the parable, once when I arrived late I was "paid" the same as the other workers). Sadly this has lessened in recent years. Many farmers now belong to a wine-making co-operative, which determines the date and time for receiving each member's harvest - so, with a weekday slot, potential helpers may be stuck at work or school. In addition, unintegrated newcomers don't think of offering their services - in fact, I remember a few years ago the new parish priest earning massive brownie points for not just offering his services but actually turning up and working hard! He would have had to work very hard to keep up with some of the village seniors, though. Palazzo has a lot of sprightly over 70s, who spend their time digging, planting, repairing and even shinning up (and falling out of) cherry trees! 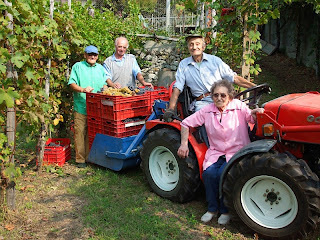 Naturally, they turn out in force for la vendemmia, often helping out at two or three different harvests (maybe in addition to their own). Remarkably, though, this activity is not confined to the sprightly. There are quite a few elderly people who spend fifty weeks of every year slowly creaking their way around the place... but come the end of September some rejuvenating magic seems to weave its way into the air... weary limbs are strengthened, enthusiasm for one more vendemmia is kindled, lifts to vineyards are arranged and off they go to help a nephew or cousin... where they work solidly for two or three hours, keeping pace with helpers half their age. Grape-picking is hard work, and also sticky; after a while hands and scissors are covered in grape juice, with various bits adhering to them. Many vineyards don't have any sort of water supply, so we end our time holding out our hands while someone dribbles bottled water over them. This is when we are reminded that a little goes a long way; half a bottle will easily wash several hands. Luckily that's often the only bit of parsimony: if the right weather has come at the right time, and there have been no other problems, then la vendemmia should yield fruits in abundance! ﻿Update: soon after posting this I received news of the sudden death of Santina, the vineyard owner's sister (in the middle photo in pink). She was 89, a kind, cheery, friendly woman. Please pray for her family, especially her brother, who found her body, and her son, a secondary school teacher, who needs to return to work this week. Santina, I am sure, is enjoying an abundant harvest in heaven.